Since moving to Colorado in 1990 I have been involved in various charities. I have helped my son include a charity in his Eagle Scout Project and also my daughter in her Honored Queen project. I feel very fortunate to live in a country of plenty, but I realize there are many who are not as well off. I first started gathering food and clothing for Native American reservations. Our oldest son and my husband would drive 25 foot long commercial trucks to Standing Rock Reservation in South Dakota for Sharing Hope. I joined in on one of those trips and also to another reservation in New Mexico. Our hearts went out to these people. When Sharing Hope closed, I discovered other places where I could contribute locally. I may not be able to help people get out of their current situation, but I consider it a privilege to help where I can. I have been crocheting and quilting since I was a teenager. I later took up sewing — and I am fast at both! 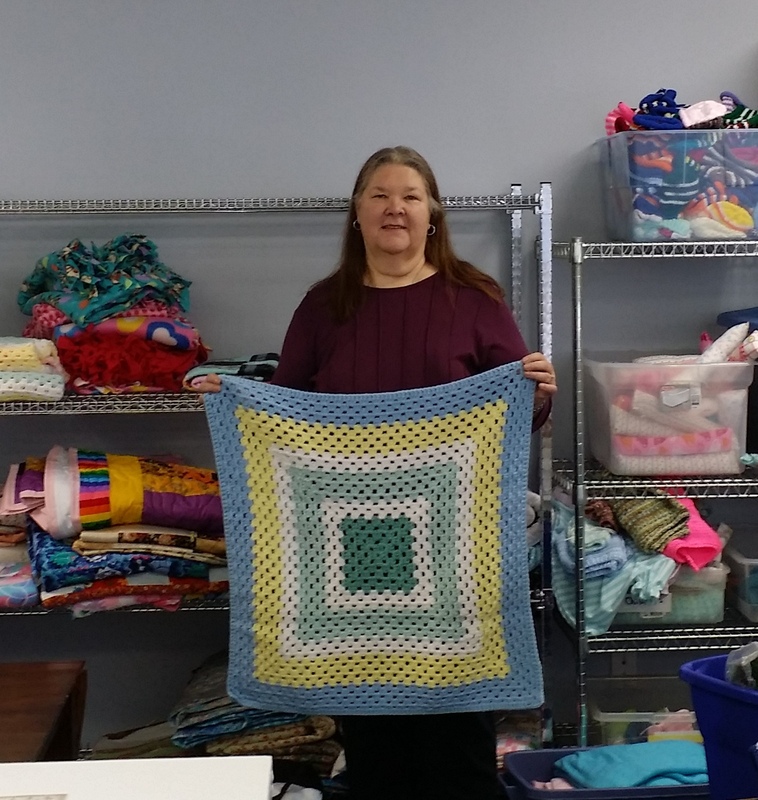 I have had a small craft business where I have sold hand crocheted or sewn items at craft shows, but have also discovered ways to share my gift with charities. I discovered Warm Hearts Warm Babies in 2005 after my first grandchild spent 74 days in a neonatal intensive care unit at birth. I saw how much the simplest things meant to parents of premature babies. After discovering the non-profit, Warm Hearts Warm Babies, I began to split my time between making items for them and items for sale. I also helped to sell some of their Christmas items in my craft show booth in fundraising for the organization. I now make between 5 and 50 items a month for Warm Hearts Warm Babies. A few years ago, I was elected to their board. The organization has also developed premature and newborn items for mothers in need (including burial packets for miscarriage and the stillborn). The items are donated in Colorado in a variety of places, from hospitals and crisis pregnancy centers to shelters, foster care and more. Every mother in need gets a layette with about 25 items, including the bag we make. Going home outfits, shirts, socks, flannel receiving blankets, a quilt or afghan, bottle, wipes, a goody bag of toiletries, bibs and burp cloths are included. We make everything with the exception of bottles, shampoo, baby lotion, baby wash and socks that must be purchased. We accept donations of cash to purchase items and material we use in making the layettes at www.warmheartswarmbabies.org. You can also become a volunteer! For more information, email info@warmheartswarmbabies.org, or contact me.